Recently on a trip to my local library a librarian said to me, "You are checking out quite a few books today." I replied, from behind my stack of fifty children's books, "I have four children and they each like to read different types of books." A friendly nod and a smile followed in between the beeps from the bar code scanner. "I chose many of the books, too. I like to read children's books." I said proudly. As an adult, I read children's books because each time I open one, I know there may be a surprise inside. I can learn something new or get lost in a great story or find a new book that my children will want me to read over and over. This week, what I found inside a book by Florence Minor inspired my family to return to one of our favorite places. After reading Heidi as a child, Florence Minor, author of two acclaimed picture books, discovered a desire to travel abroad. "I had a poster of Zermatt (Switzerland) on my bedroom wall, and was determined to visit that beautiful country." She later spent three summers in Europe which she attributes to "much of my personal growth...all because of reading Heidi." (On Beyond Words and Pictures). Florence Minor's journey toward becoming a children's author benefited from her experience in the Alps and later her career as a film editor for ABC News. (Mazza Museum Summer Conference Keynote). She applied the business and editing skills she had learned in her first career to start another career in children's book publishing with with her husband Wendell Minor. Florence has edited many of Wendell's books including Wendell Minor: Art for the Written Word. (Pennsylvania's One Book Activity Guide). Wendell has illustrated both of Florence's picture books, Christmas Tree! and If You Were a Penguin. They are quite a team! Florence Minor admits, "I never thought I'd end up as a children's book author, but it just fit, it clicked -- we are really capable of much more than we think we are." (theday.com). Christmas Tree! was Florence's first book. Kirkus Reviews said, "The poetic, rhyming text asks the reader in just a few words per page to imagine different kinds of trees." This book encourages children to imagine -- What kind of Christmas tree do think mice would have? Or how about dogs? What type of Christmas tree would you find atop a lighthouse or in a parade? The text is matched with beautiful illustrations and ends perfectly. I feel it would make a wonderful gift under your "Christmas Tree" this coming holiday. 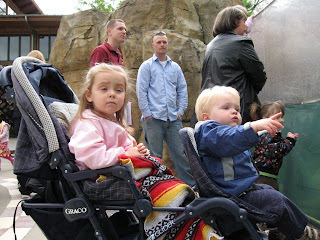 When I first became a stay at home dad, my daughter and I spent a lot of time at our local zoo. Almost weekly we were visiting the lions, tigers, bears, and PENGUINS. 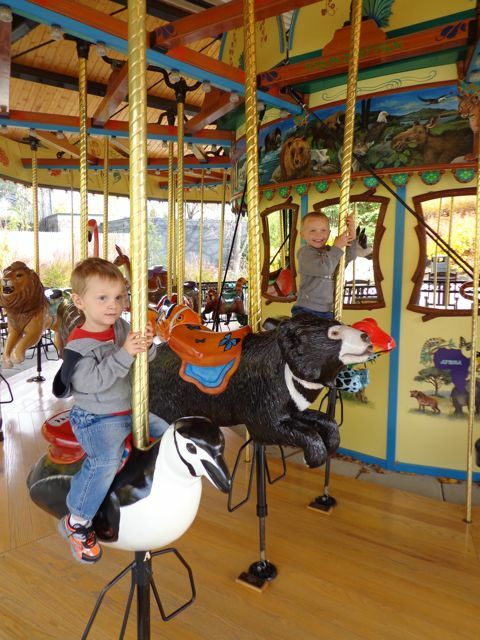 We loved coming face to face with the penguins at the Akron Zoo. Here is one of my favorite pictures of my oldest daughter when she was one year old. Fast forward a few years, when my oldest son was young enough to be carted around in the front seat of a stroller. 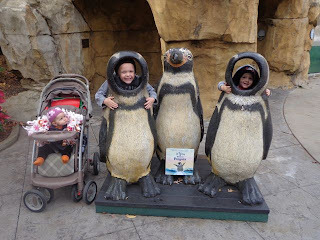 My children were able to come face to face with the penguins while hearing me talk all about the penguins when I obtained a summer job in the education department of the zoo. My favorite talk I gave each day was at the penguin exhibit. 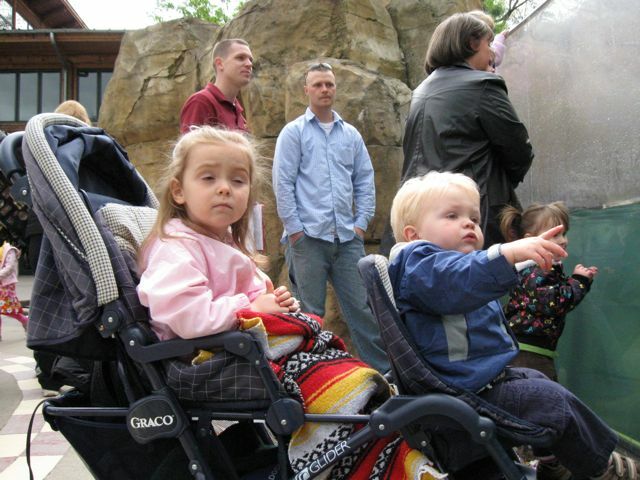 Here is a picture of my children while I, in my maroon shirt, answered questions from zoo patrons. 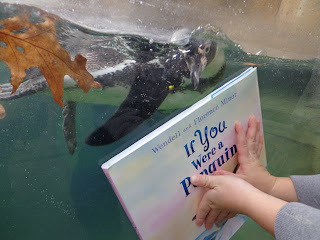 I wish I would have had Florence Minor's book, If You Were a Penguin, the 2009 Pennsylvania's choice for ONE BOOK FOR EVERY YOUNG CHILD, when I was working at the zoo. 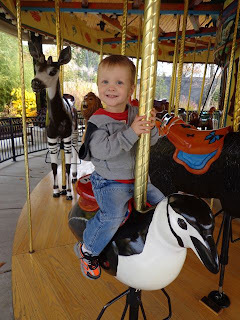 It highlights so many of the things I loved to mention in my zoo talk -- penguins can "fly" underwater, penguins can live in warm and cold places, and baby penguins eat food directly from their parent's mouth! Florence Minor said, "After spending an afternoon with my four year old niece, Adrianna, the idea for If You Were a Penguin was born. 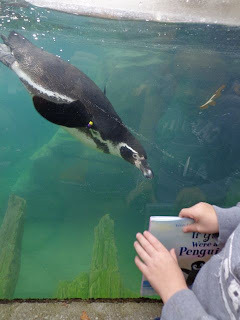 Adrianna told us how much she loved penguins, and it was then that we decided how much fun it would be to do a book about penguins for Adrianna's age group." (Pennsylvania's One Book Activity Guide). 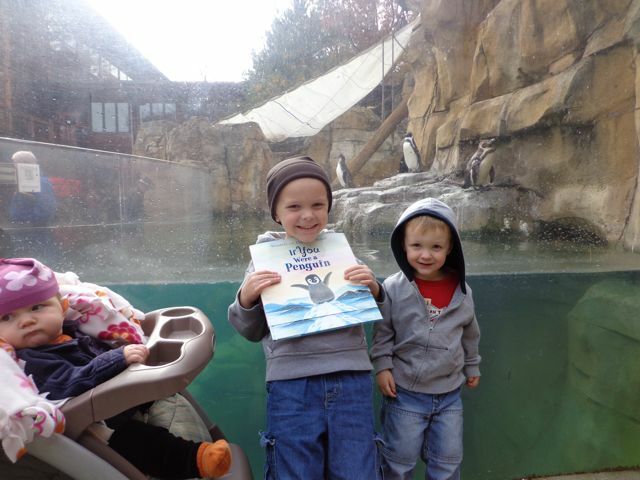 This book brought back so many great memories of being at the Akron Zoo that we returned to visit the penguins. I was so excited to take my youngest daughter for the first time! My two penguin boys with their sister. We read If Your Were a Penguin right next to the exhibit. 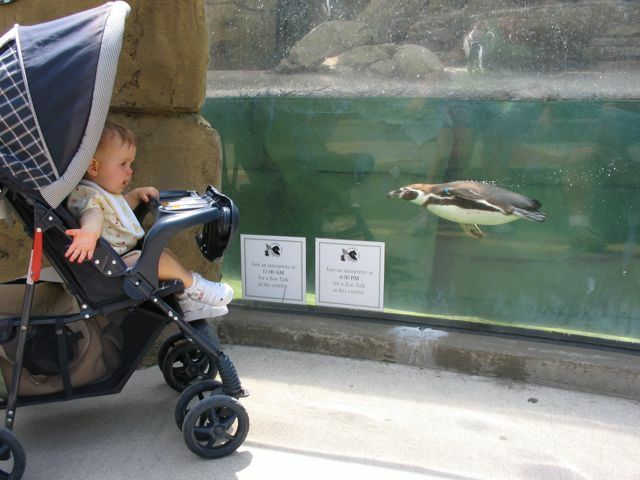 Then, one of the penguins became quite curious. I think he liked what he saw! We finished our visit with a ride on the carousel. My youngest son picked the perfect seat for his first carousel ride. This week, I opened a book and found many memories. Then, I read the book to my children and made many more. My mother was an excellent cook and baker, and so my sister and I got to request our favorite dinner and dessert for our birthdays. My dinner request was usually the same every year: chicken paprikash and spaetzel; but dessert was always the same: lemon meringue pie. I grew up on home baked goods, as my grandfather (my mother's father) had been a professional baker, and since he was the one who coached me through baking that special pie for the first time on my own, it always had, and continues to have, a special place in my heart (not to mention my taste buds!). Florence, my family hopes you have a fabulous birthday filled with family, friends, fun...and some yummy baked goods! Thank you so much for sharing about your birthday! And I can't wait until June 2013 to read your next book, If You Were a Panda Bear! 8. SEND a loved one a HAPPY PENGUIN e-postcard at Minorart.com! What a wonderful presentation from a duo dedicated to writing and illustrating educational and interesting children's books. Thank you, Rhona. Wendell and I certainly do love bringing the joy of books to children! Love all those penguins! And that photo of your penguin kids! Florence's books look delightful. Happy Birthday, Florence! Wow! 50 books? I think you topped my record! Looks like your kids had fun! We love what we do, and had a great time in PA! We love what we do, and had a great time sharing our book with children in PA.